Do you want to be in a supportive, encouraging environment with other women in order to explore creativity and spiritual practice? Are you curious about how to deepen and embody your spiritual journey towards mindfulness, personal growth, vulnerability and vitality? I want to invite you on a unique journey. If you want to learn more about yourself, create meaningful community, find a way through a stuck place, seek clarity about a new direction, or simply give yourself time to play, this 6 week course may be for you. My name is Evelyn Ward de Roo and I want to help you focus on your intuitive creativity, your spiritual journey, your innate feminine wisdom and the transformative power of wholehearted presence. I have developed this course for women who want to discover their gifts and live from a place of authenticity. It is for women who want to break free, get real and be vulnerable. I believe that women are hungry for ways to craft and experience a spirituality (and a God) that is uniquely, profoundly theirs. One women’s story has the capacity to change everything for good. To join other women in circle. These will be soulful and playful gatherings. This course creates a safe forum for personal exploration. To get quiet, discovering how giving time for the inner peace of meditation can awaken your intuition and creative practice. To make sound, discovering the connection between finding your naked voice and the presence of God. Join with other feminine energy as we spontaneously explore our voices from that quiet place where deep listening unfolds into beautiful improvisational soundscapes. To make art. You will be encouraged to explore & strengthen your own sense of freedom, intuition and play as valuable tools for insight and guidance. 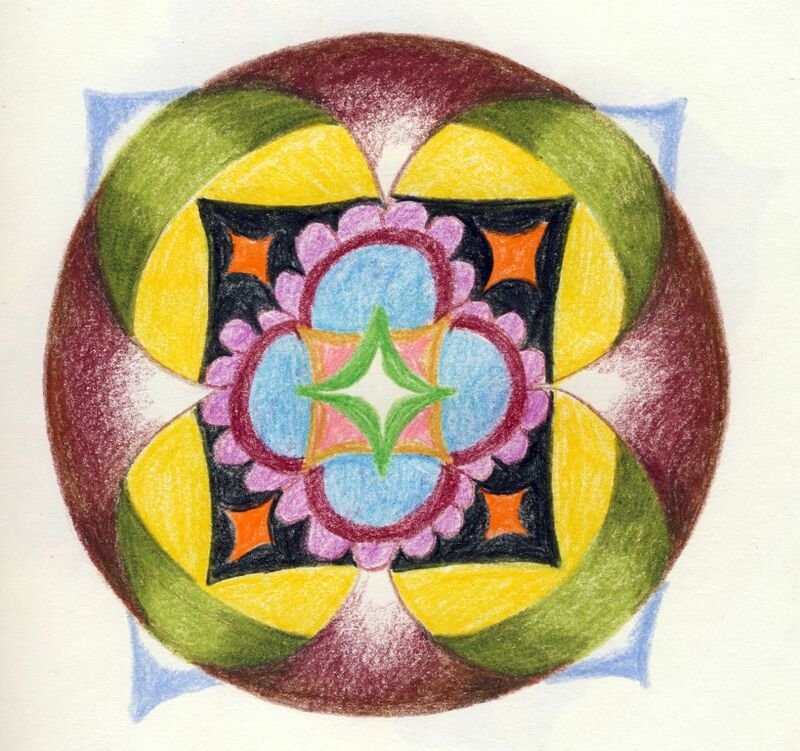 Intuitive painting, sketching, collage, mandala drawing and Art Journaling will be encouraged. To connect with your own body, body-centred practices to ground you in your own skin, with the content. This isn’t just head stuff. You will be invited to walk a labyrinth, move, dance and sing. A mid-week Integration & Inspiration love-letter from me, to keep the juices flowing, with fresh perspective, and to assist on your creative journey and sharing. A optional discussion invitation to a private facebook group, where you will have the chance to interact with all the participants at your own pace, share art, process, thoughts, story, etc. Instead of New Year’s resolutions that you’ll abandon in a few weeks and feel guilty about, why not start your year off with Sonica Creativa? The process will lend clarity to your year and to your continued personal growth journey. 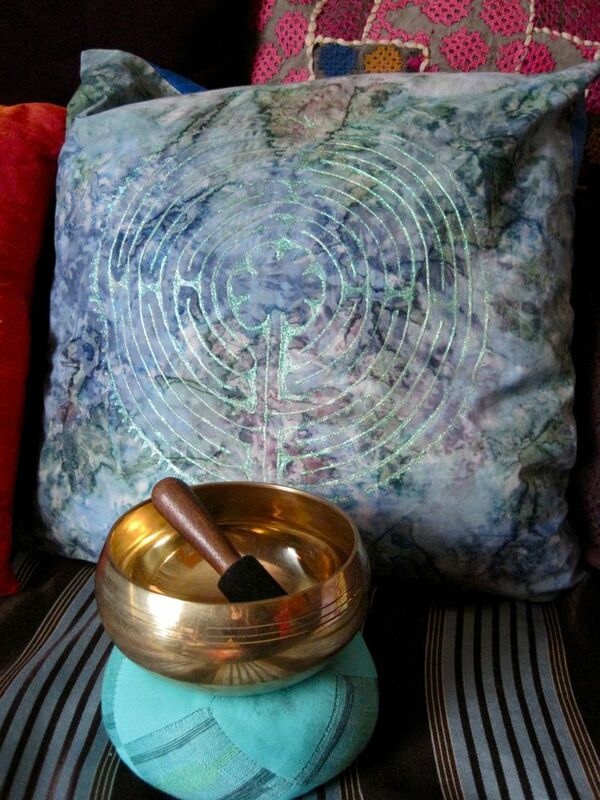 This course combines spirituality, musical meditation, creative process, and play in one holistic circle. A 6 week women’s circle that focuses on intuitive creativity, our spiritual journey, our innate feminine wisdom, and the transformative power of wholehearted presence. If you desire to live your gifts from a place of vitality then this course is for you. A safe, heart-centered space in which to explore how you trust, listen to and speak with Spirit, your Self, other women. A space where you can voice your doubts, longings, and fears about what spirituality looks like and means allowing you to step into a life that is expansive, generous, and authentic. 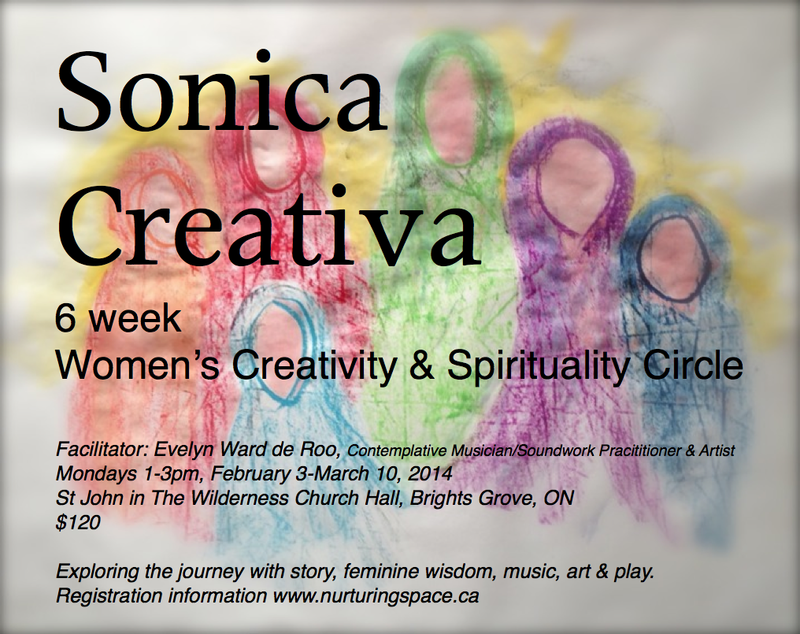 A supportive, encouraging environment, where each woman is an equal player – rich with discussion, musical sound, diverse insight & story, visualization, creative expression, inspirational art playtime and tools to explore integrating our inner and outer truths. A unique chance to nurture and deepen your confidence in your own creative practice. A time of honor and celebration – between the wisdom of your mind, body, and spirit. Questions or concerns? Please contact me. Note: If you register and are not completely satisfied after the second lesson, I will refund your registration.